Blast Cleaning Technologies was founded on repairing, rebuilding and upgrading shot blasting equipment. Today we understand better than ever the growing needs of our customers and have perfected this part of our business over the last 15 years. Regardless of the make or model or your equipment, we can assist you. 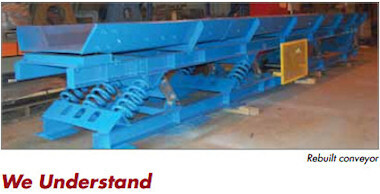 Our Our programs are designed to maximize your shot blast equipment and optimize the performance of your equipment. We will upgrade your equipment and use every appropriate innovation to guarantee improvement to production time and maintenance costs. Our goal is to work with each customer to bring the machine back to peak performance and address available enhancements that can improve your operation. Examples include: meet an increased production requirement, adapt to change of product mix, or just improve overall operating efficiency of your blasting equipment.